Aside from the first two Superman movies, the Batman franchise actually consisted of comic book movies that actually weren’t (completely) terrible. For every Batman movie there were 10 Punisher/Captain America/The Phantom/The Shadow movies released upon the unsuspecting public giving comic book movies a bad name. Ironically and taking after that other DC property, Superman, the fourth Batman movie, titled Batman & Robin, is one of the worst comic book movies ever made. In 1989 visionary director Tim Burton made Batman and the production was overseen by the studio. After it was a smash hit they gave him free reign on the sequel and he made true Tim Burton movie; dark and gloomy. It wasn’t the success they hoped it to be and parents complained about the dark and violent content so they replaced him with Joel Schumacher and created the more kid-friendly Batman Forever with lots of neon and comedian Jim Carrey as one of the villains. It wasn’t a good movie, but it performed much better at the box-office than Batman Returns and so the studio gave Joel Schumacher free reign to make a two hour toy commercial featuring a homosexual couple. As the saying goes “a fox is not caught twice in the same snare”, but that apparently doesn’t apply to the studio executives of Warner Bros.
And there you have it. If Batman Forever can be considered as the planks of a coffin for the Batman series, then Batman & Robin has just hit the first nail in, and it won’t be the last. This movie consists of a 125 minutes of nails being hit one after another, making sure this franchise would be dead and buried once this movie was done with it. Next we are treated to one of the major villains in the movie: Mr. Freeze, played by the last guy on earth you could envision yourself as a scientist: Arnold Schwarzenegger. Due to an accident in a lab his body has to be exposed to an extremely low temperature in order to function so he built himself a suit which runs on diamonds. 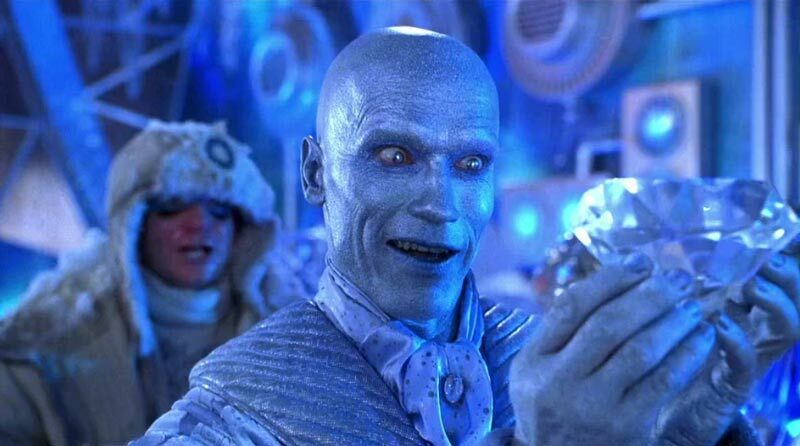 He’s trying to rob a large diamond from the Gotham City Museum Of Natural History until Batman & Robin barge in. The next 10 minutes we are treated to Mr. Freeze freezing everything while delivering one bad pun after another, Batman sliding from the head of a frozen dinosaur to its tail, Batman and Robin having ice-skates with auto activation in their boots, them playing ice hockey with Freeze’s goons, Freeze’s escaping in the most obvious of escape vehicles: a rocket, Batman and Robin gliding through the air on a bunch of panels functioning as surfboards with Robin yelling “cowabunga” all while the laws of physics are completely ignored. And this is just a small summary. After watching the first 15 minutes you’re already wondering if anybody has actually read the script or paid attention during physics before signing on. Arnold Schwarzenegger’s Mr. Freeze deserves a special mention. He has proven to be able to portray a great villain and his performance as Freeze is exactly what you would expect from him; without depth and communicating in one liners. The strange thing is that out of all the characters in the movie, aside from Alfred, Freeze is the only one with a developed back story. His wife was struck by a terminal disease named MacGregor’s syndrome and he has her cryogenically frozen so he could work on a cure to save her life. But an accident in the lab turned him into Mr. Freeze. Cut from funding he turns to a life of crime so he can continue his work and save his wife. Somehow, someone must have mentioned at one point during the casting process: this is a great role for Arnold Schwarzenegger. If I was his supervisor I would have requested a urine sample immediately. It’s also noteworthy that all of the previous Batman movies had at least one villain portrayed by an Academy Award winning actor. 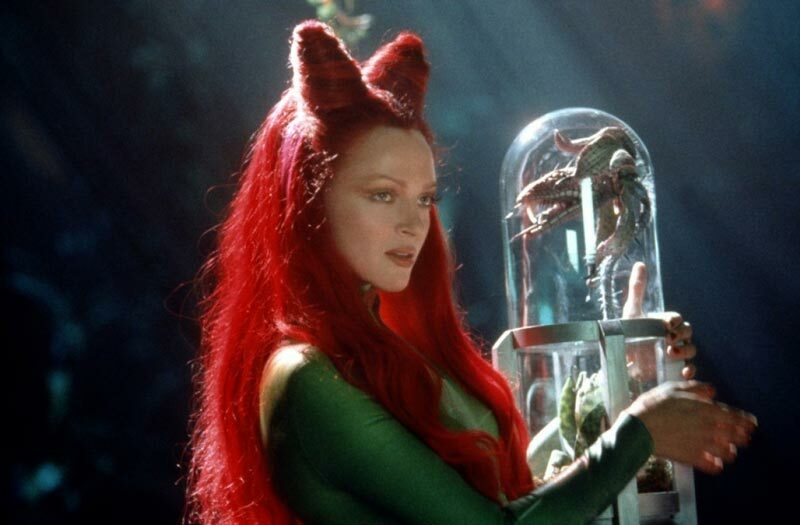 This one just has Academy Award nominee Uma Thurman as Poison Ivy, a one-note performance which at one point requires her to walk around in a monkey suit. Next to former Mr. Olympia there’s also wrestler in the role of Bane. I guess that after the Two-Face/Riddler Team-up in the previous movie the villains had to be even more goofy. If I would to describe Batman & Robin in one word it would be “shallow”. Everything about this movie is covered by that moniker. They have paid great attention to detail and made it even more colorful than the previous movie, but underneath it’s all so empty. The movie lingers from one scene to another, trying to sell toys and other merchandise while pretending to have something of a plot. This is probably also the reason the movie introduces Batgirl; another action figure that could be put on the shelves. She’s played by Alicia Silverstone in a totally unconvincing performance. She’s also supposed to be British, but there’s no accent to be heard. Both her and Chris O’Donnell’s Robin are the most irritating factors in terms of characters. Robin’s schtick this time is that he’s tired of always standing in Batman’s shadow and constantly wines about everything. George Clooney is wasted as the movie isn’t interested at all in Bruce Wayne. He’s just here to provide the suit with a charming chin. The Batman movies have always been about the villains, but the previous movies at least made him moody and touched upon his psyche. Here’s he’s just this happy go-lucky billionaire with a thing for skintight rubber outfits and and a young boy at his side. Batman & Robin is truly one of the greatest bad movies ever made. This is one of those rare times that a movie with a budget so big and so many (talented) people involved somehow turns out so bad. It’s actually very entertaining and a blue-print of what happens you make an adult comic book character and put him in a movie catered to kids in order to sell toys.